After two slower months, sales of the United States Mint’s American Silver Eagle bullion coins rocketed higher in January 2012 to more than 6 million ounces. Sales of American Gold Eagles also jumped, reaching 127,000 ounces. The month of January has traditionally been one of the strongest for US Mint bullion sales. This is driven by strong demand for the newly dated versions of the coins from collectors and dealers. 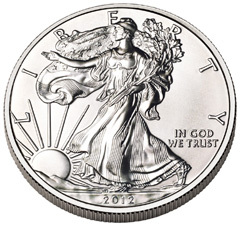 The Mint began sales of the 2012 Gold and Silver Eagles on January 3, 2012. For the first time in several years, initial orders were not subject to allocation, as adequate supplies of coins were available to meet anticipated demand. Opening day orders reached 3,197,000 of the one ounce Silver Eagle bullion coins and 37,500 ounces worth of Gold Eagle bullion coins, across the four different sizes available. For the full month of January 2012, Silver Eagle sales reached 6,107,000. This is significantly higher than sales levels for the prior two months when the Mint sold 1,384,000 coins in November and 2,009,000 coins in December 2011. Compared to the year ago period, the monthly sales total registers a small decline. In January 2011, sales reached a monthly record of 6,422,000. For January 2012, Gold Eagle bullion sales included 84,500 one ounce coins, 49,000 half ounce coins, 38,000 quarter ounce coins, and 85,000 tenth ounce coins, representing a total of 127,000 ounces. Once again this was higher than the previous two months when the Mint sold 41,000 ounces worth of coins in November and 65,500 ounces worth of coins in December 2010. Compared to the year ago period, the sales total shows a slight decline. In January 2011, sales had reached 133,500 ounces. The United States Mint distributes American Gold and Silver Eagle bullion coins through a network of authorized purchasers. These authorized purchasers may buy the coins in bulk quantities based on the market price of the precious metals plus a fixed mark up of $2 per silver coin and a percentage mark up of 3%, 5%, 7%, and 9% for one ounce, half ounce, quarter ounce, and tenth ounce gold coins. The bullion coins are then resold to secondary dealers and/or the public.